A delicious and easy to make paratha with garlic. Parathas are a popular Indian bread typically served during breakfast in North India and eaten during luch, evening tiffen or dinner. 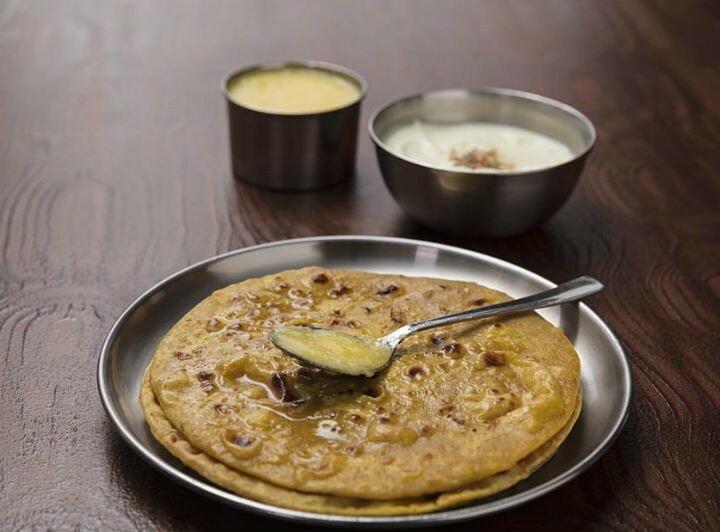 There are numerous variations of paratha depending on where you go. Serve this with a side dish of choice for breakfast, lunch or dinner. Soft paratha with the sharp taste of garlic. Fantastic choice for a quick lunch or dinner. Combine the maida, water, ghee, salt and sugar in a large bowl. Mix well and keep aside for 2 minutes. Make small/medium balls of the dough and roll them out. Mix garlic, red chilli powder and coriander leaves. Sprinkle some on the rolled paratha. Fold the paratha from all sides and shape into a ball so that the ingredients added at step #5 are well mixed. Roll it again into a medium circle. Heat little butter in a tawa over medium flame. Cook the paratha on both sides, applying little butter around the edges. Remove and serve hot with side dish of choice. 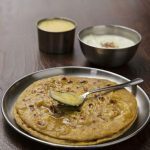 Feel free to comment or share your thoughts on this Garlic Paratha Recipe from Awesome Cuisine.